WASHINGTON (CNS) — With a huge swath of the United States — from the upper Midwest to the Atlantic Seaboard — alternating between one-two punches of cold snaps and snowstorms, everybody’s talking about the weather. Catholic Charities of the Archdiocese of Baltimore works with Baltimore city authorities to keep people warm when a “code blue” is announced. Mary Anne O’Donnell, its director of community services, said she got the code-blue call early in the afternoon of Jan. 5. That activates contingency plans to keep My Sister’s Place shelter and Our Daily Bread employment center and feeding program running. “We try to bring in some people who might be able to work additional hours, some extra volunteers, some central staff who can work at our shelter site,” O’Donnell said. As a result, My Sister’s Place and Our Daily Bread haven’t closed due to weather in 31 years. This includes the “snowmageddon” of 2010. O’Donnell, an 18-year employee of Catholic Charities, knows; her first day of work was Jan. 8, 1996, the first weekday after a weekend storm blanketed much of the East Coast with 16 inches of snow. Catholic Charities agencies in LaCrosse, Wis., and Minneapolis run daytime drop-in centers to provide a safe haven during the day for homeless folks whose night shelter isn’t open during the day, according to Patricia Cole, a spokeswoman for Catholic Charities USA. Cole said Catholic Charities in the Diocese of Altoona-Johnstown, Pa., offers two programs to help residents get through the winter. One is a winter heating assistance program that delivers heating oil, wood, coal, propane or kerosene to households that have run out of funds through a low-income assistance program or which did not qualify in the first place. A community “fuel bank” operates out of Catholic Charities’ office in Bellefonte, Pa. The other program provides shelter for individuals and families in Johnstown in a hotel, while Catholic Charities’ own shelter is being readied for occupancy — perhaps in time for next winter. The agency’s other offices place homeless people in hotels if they are not eligible for other programs and it is too cold to stay outside. In Detroit, the Capuchin Soup Kitchen has served meals for more than 80 years. On a typical day, it serves 2,000 meals — breakfast, lunch and dinner — at two sites on the city’s near east side. The numbers were down Jan. 6, according to Capuchin Brother Jerry Smith, who directs the soup kitchens, “but it’s significant to me that we have people at all. They are pretty much that desperate. The snow is just up the kabooie.” Ten to 12 inches fell Jan. 5 in the Detroit area, while temperatures nose-dived overnight. 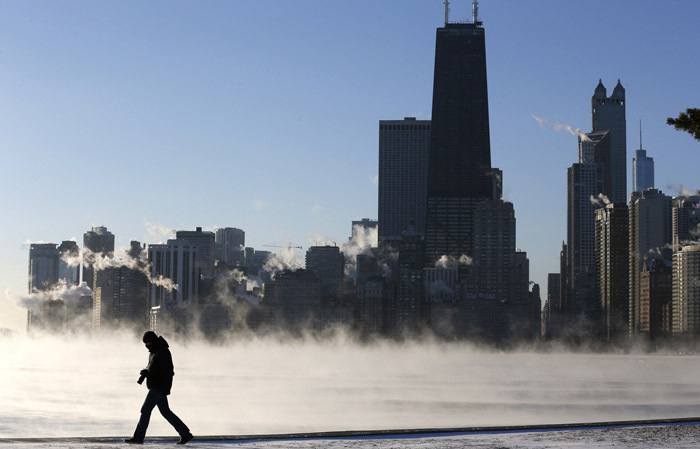 The forecast Jan. 6 high for the city was 9; the expected low, 10 below zero. Because of the frigid temperatures, “we allow people to remain in the building. The hard part is closing time, 4:30,” when he has to ask the homeless to leave, “and I hate doing that,” Brother Smith said. “The snow can be inconvenient, but the cold weather is life-threatening. They’re living in abandoned houses. They’re out on the street,” he added. 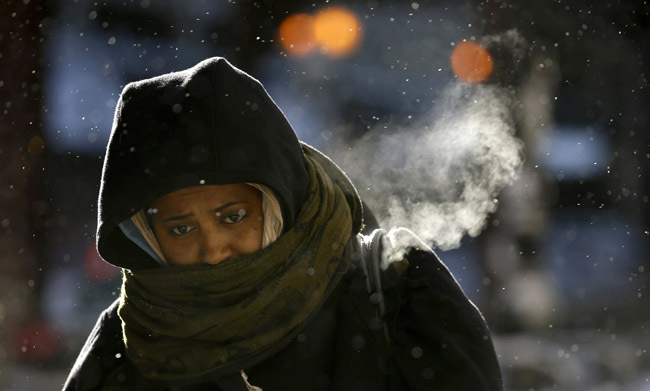 The projected wind chill for Detroit on Jan. 7, he said, was 40 below zero. In Macomb County, Mich., a suburban county just north of Detroit, 30 Catholic churches are part of a 90-church consortium called the Macomb County Rotating Emergency Shelter Team. They take turns hosting 30-60 homeless visitors at a time. An estimated 1,100 residents of the county are homeless, according to executive director April Fidler. “When the weather’s like this, the churches will allow our guests to stay in all day long, or our doors are open all day long, so they’re not out in the frostbit cold,” Fidler said. Families can be put up in a hotel for the evening if needed, she added. Even in the ‘burbs, “hoooo, it’s cold!” Fidler said. “I got stuck getting out of my driveway this morning for an eight o’clock meeting. My husband had to help me.” This, she added, despite him going out four times the day before to shovel snow. Immaculate Conception Church in downtown Fort Smith, Ark., was opening its doors to the homeless Jan. 6 because of the cold weather, with a forecast low of 10 degrees. Parish volunteers were to provide dinner in the evening and breakfast in morning.